↑ 5.0 5.1 "Tasmanian State Emblems". www.parliament.tas.gov.au. 29 January 2003. Retrieved 23 January 2013. 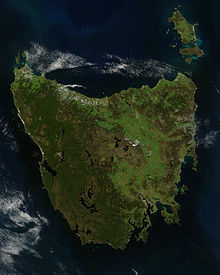 ↑ "Proclamation of Tasmanian mineral emblem". Tasmanian Government Gazette. www.parliament.tas.gov.au. 4 December 2000. Retrieved 23 January 2013. ↑ "Aboriginal Life Pre-Invasion". www.utas.edu.au. Retrieved 2018-09-03.